When butter has melt, add chopped shallots. Leave covered, stirring frequently, for about 10 mn or until translucent. Add sugar and stir. Let shallots caramelize for a couple of minutes, then add raspberry vinegar. At that time, you should probably go for medium heat. It’s important when adding alcohol to get it to a (smooth ;-) ) boil so the strong taste evaporates. When the strong smell is gone, you’re done. Take pan off heat. Cut prosciutto into small pieces. Fill the bottom of your Chinese soup spoons with caramelized shallots. 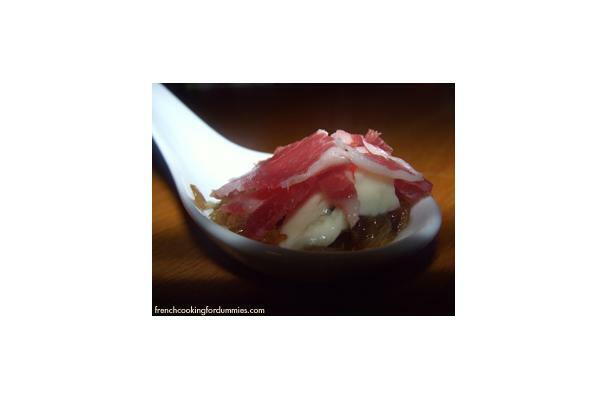 Add a dice of blue cheese and top with prosciutto pieces.